While I no longer live on a gravel road, I still somehow managed to live on a farm and by a farm, so the air can still be "country fresh". A Modern-Day Slave, An International Art Dealer, And The Unlikely Woman Who Bound Them Together. He was a black man born to sharecroppers. Sharecroppers were still basically owned by "the Man". He kept track of what they made taking care of cotton and he kept track of what they bought from his store and somehow at the end of the year, there was also a debt to "the Man." This is the life Denver Moore was born into, though his was even worse as he was the son of a sharecropper and then there weren't even records kept, he just lived and worked there with no chance of a better life, until one day he decided to ride the rails. He lived homeless, he lived in jail for the next many, many years. He was born to lower middle-class parents. His grandpa also had black people working his plantation, though he treated them a bit better. He grew up and became an international art dealer, living high-end and making millions. This was Ron Hall. The unlikely woman? His wife Debbie. It's just a great story of what God can do when people are willing to listen and follow through. Debbie was an exceptional woman. Hearing of her husband's affair, she fought for their marriage. This included calling the woman he had an affair with and forgiving her and taking part of the blame for not being the wife Ron needed. Amazing courage. And it was Debbie that first forced Ron to the Union Gospel Mission and forced him to become friends with Denver Moore. And now I need to stop or I will tell the whole story. 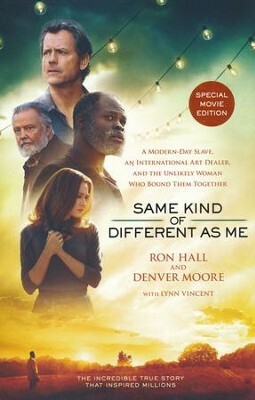 Suffice it to say, there's a movie out telling this story and another book called "What Difference Do It Make?" telling more of Denver's story. Both are ones I really want to see and read. Denver may have been homeless, but when he spoke, there was wisdom. If you want to read about bravery, courage, prayer, commitment, etc. read this book. It will increase your knowledge of what the homeless go through and increase your faith that there are rich people willing to get down and get dirty and make a difference with their hands and not just their money. A challenge for those of us in middle-class America to make a difference. It's just a compelling story. Go read it for yourself. I received this book from Book Look Bloggers and was not required to write a positive review.